This is a picture book biography of Zitkala-a, born Gertrude Simmons Bonnin, a Native American woman at the turn of the nineteenth century. Zitkala-a was a writer, editor, musician, teacher, and political activist in a time when even basic education was uncommon among Native Americans. 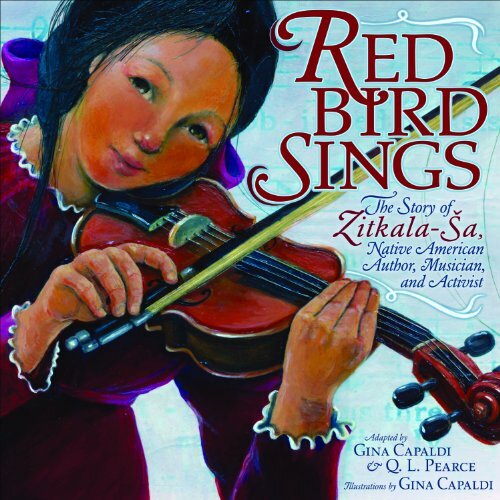 Gina Capaldi has written and illustrated a number of books, including A Boy Named Beckoning: Dr. Carlos Montezuma, True Story of a Native American Hero, winner of the 2009 NCTE Orbis Pictus Award. She lives in San Dimas, California.